Two (2) Boxes of Three Pepper Blend Water Crackers 2 oz. Chardonnay Wine Cheese Spread 3.75 oz. Merlot Wine Cheese Spread 3.75 oz. Cabernet Sauvignon Cheese Spread 3.75 oz. White Zinfandel Wine Cheese Spread 3.75 oz. Ghirardelli Assorted Chocolates .53 oz. 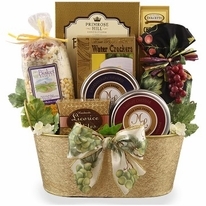 A beautiful rectangular container for this outstanding wine and cheese gift basket is certain to be admired and reused over and over. 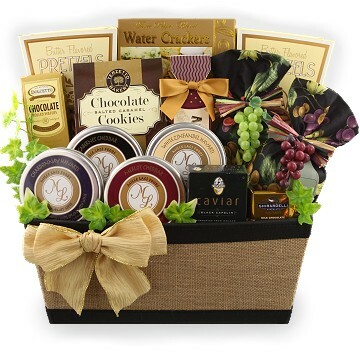 We have selected only delicious and high-end products to fill this wine-themed gift making it both outstanding in taste and in presentation. 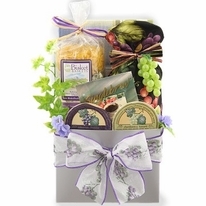 Artfully arranged your recipient is sure to enjoy a selection of spreadable wine-themed cheeses complete with water crackers, caviar and not one but two wine-a-ritas that are very delicious when mixed with their favorite wine or even fruit juices which make it suitable for non-drinkers and children as well. 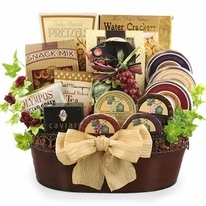 This exquisite wine themed gift is an excellent choice for business appreciation gifts to friends and family as well. The wine-a-ritas are delicious and they have won not one but TWO NATIONAL awards for their delicious taste. This outstanding wine-themed gift can be delivered to homes and offices without a signature as no actual wine is included.